Welcome to the Vegan-Nutritionista.com newsletter that focuses on helping you learn more about veganism and how to apply it to your daily life. The Vegan Bytes Newsletter is dedicated to keeping you up-to-date with the world of food, and answering your vegan nutrition questions. *Your questions: "Why Should I Care About Animals?" *Your questions: "How can I be a healthy vegan athlete?" We can already feel the signs of fall in Tennessee. Some leaves are falling, night comes earlier and earlier, and all the squashes are surfacing at the farmer's market. With fall comes Halloween and Thanksgiving and football and soups and stews. With each passing month this year, we'll talk about ways to make the traditional holidays more fun for vegans. Remember, I write this newsletter and produce Vegan-Nutritionista to help you, so if you ever have a suggestion for a topic you want covered in the newsletter, please let me know. I am personally looking for ways to do more and to help more, so I would love your help figuring out how to do that. Portland lived up to its reputation as an amazing place for vegan food. For the first time I can remember, we were never hungry on a vacation. You can also get everywhere on their extensive bus, tram, and light rail line. Beyond food and accessibility, there's also incredible scenery like the Columbia River Gorge and Mt. Hood, beaches, wineries, and all kinds of sporting activities. Blossoming Lotus: they have a location in the Pearl district downtown and a sit-down place in Irvington. Since our hotel was right near the Pearl, we went three times over the course of the week. Our favorite dishes were a living caesar salad with raw flax crackers, a raw pasta with pad thai dressing, and a giant burrito with beans and veggies. In Irvington, the Blossoming Lotus menu was more extensive. We had a delicious coconut milk chai tea, a four-cheese lasagna with cashew cheese, almond mozzarella, tofu ricotta, and almond parmesan. It was so rich and creamy that we could make it through only a third of it. We also had a Caribbean plate with jerk tofu and plantains flambe that we thought even Bobby Flay would praise. We also loved Portabello Vegan Trattoria, which is a cute little Italian vegan restaurant in SE Portland. The best dishes we had there were their homemade gnocchi with basil pesto and their renowned tiramisu. I'm now on a quest to remake that tiramisu with the same perfect sponge cake, tangy marscapone, and just-right texture. Vita Cafe was another gem that we hit up twice, beginning and ending our trip with a dinner there. It's on NE Alberta, which has a ton of fun stores and cafes. Vita makes their own seitan and offers several dishes with it as the star, such as a Philly cheese steak, BLT, and club sandwich. We loved their creamy mac-n-cheese and their BBQ turkey sandwich. We also had to try the famous Voodoo Doughnuts, so we picked a day with the shortest line we could find (it still snaked out the door and halfway to the corner) and tried them. The vegan voodoo doughnut itself is so cute. 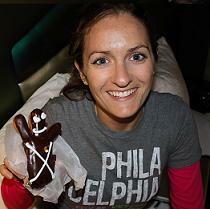 It's a traditional doughnut shaped like a person and filled with cherry jelly, then dipped in chocolate, decorated with white icing and stabbed in the heart with a pretzel stick. Very cute. They have a cult following for a reason. The Saturday downtown farmer's market was incredible; stocked with amazing fruits and veggies, beautiful flowers, jams, breads, and more. We sampled our first Dave's Killer Bread, and it was beyond delicious. They have about 20 different types of bread, but we settled on a Sin Dawg, which is basically their healthy whole grain and seed bread laced with cinnamon sugar and molded into a foot-long log. Mmmm.... I'm getting hungry just writing about it. Once we figured out that the Sin Dawg is in testing right now and not available in the grocery store, I had a mild panic attack before we decided to go to the actual bread factory. The only drawback I can see to Dave's Killer Bread is that it isn't distributed all over the country. When we walked outside with a bag full of Sin Dawgs that we ate for breakfast the rest of the week, we saw Bob's Red Mill across the street and stopped in for a peek. As you can expect, it's the grain motherlode store. I picked up some nutritional yeast, graham flour, and fantastic smelling cinnamon. The coolest thing about Portland's food scene is probably that no matter what restaurant you go into, there are options for vegans. You don't even really need to explain yourself, you just ask for the vegan options and they happily oblige. I hope you all get a chance to visit someday! The next time you get a newsletter, on October 13th, the vegan menu plan will be ready. It focuses on fall and winter recipes like my spicy bean chili, butternut squash soup, spiced popcorn, and easy spaghetti and meatballs. You'll also get recipes, pictures, and grocery lists. The menu plan will be easy enough that you can just follow right along, making weekday dinners for a month. But it's also flexible. If you feel like mixing weeks or picking your favorite recipes for different weeks, it will be easy to do that as well. While I know some of you were hoping it would be ready sooner, I didn't want to sacrifice quality to get it done quickly. Don't forget that on Vegan Nutritionista you can find many easy vegan recipes, raw recipes, and places to share and learn from other readers. I can't wait to share the fall recipe book with you! "I Don't Care About Animals"
How do you respond when people tell you that they just don't care about animals? I can never believe that people think that and I never know what to say. I know just where you are coming from Nia. When people tell me that I can barely conceal my cringing. I normally try to bite my lip so as not to be openly outraged. Ultimately, people who say, "It's just a cow. Why do I care about a cow?" don't know what is really happening to that cow, both in life and in the process of being killed. If, for instance, that same person were to actually witness the slaughter of a cow first-hand, I think they would hesitate to say they don't care about the cow. After all, it's not so much the animal as the suffering. Paul McCartney said, "If slaughterhouses had glass windows, we'd all be vegetarians." He's completely right, and that's one of the reasons that we are never allowed to see the killing process. I do know of a few smaller farms that allow viewers, and they make the process much more humane. But, on the vast, vast majority of farms, the suffering any of us would see would surely be unstomachable. However, if there is somehow a way that a human could be so numb as not to be affected by the suffering of sentient beings, even if those beings aren't the prototypical cute animals, the best way to approach that discussion (if you are planning to have one), is to look at it entirely from that person's point of view... How does eating animals affect them? After all, that's what they are saying they care about... themselves, and possibly the lives of other humans. They might be interested in the environmental affects of animal farming, but often I find these same people are not really interested in the global affects of their diets either. So, I approach it from the health angle. There are numerous studies about the benefits of a vegan diet and the drawbacks of a diet heavy in animal products. Check out the plethora of studies on the healthiness of plant-based diets here. I hope that helps! Never let other people's misunderstanding dampen your spirit, and try to remember back before you knew about veganism to help them. Have your own burning questions about veganism? Submit your vegan questions here. When you ask and help answer other people's questions, others learn as well. "How Can I Be An Active Vegan"
I have been a life long meat eater, and a more recent self proclaimed 'foodie' as I have been more exposed to great food. I grew up in a small town in the midwest and now live in L.A. and work in the restaurant industry. I am reading a book called The Face on Your Plate: The Truth About Food, a book I'm sure you've heard of. I feel extremely obligated to beome a vegan. Red meat is easy for me to get rid of and even poultry. I love almond milk so that's a no brainer. I work in a sushi restaurant so that is where I begin to already feel myself suffering and I am finding it hard to imagine myself without every product containing casein or some form of milk. I am extremely into fitness, martial arts and lifting weights. I love to look muscular and I am concerned with keeping my shape. I know I will be healthier but are there some simple tips you could give me for getting the right combination of protein and carbohydrates for a very busy, active girl like myself? Also, what physical and mental transitions have been the most positive for you and your conversion to vegan? I appreciate your time and effort and look forward to hearing from you!!! Thanks for writing in, and I'm glad to hear you are reading about the plight that animals go through to become our food. As far as your transition, I urge you to take it at a pace that is comfortable for you, but don't not make a move because going full force is too hard. My own transition took a long time as I ate fish (but no meat) for 15 years. I wasn't educated on veganism at that point, but my point remains. It takes time to make a change in a lifestyle you've been living for your whole life. So, if for now you don't want to look for casein in everything and you want to keep eating fish, don't judge yourself. Read the full question and answer here. Anyone who's from the Southern U.S. knows how hard it can be to find a vegan restaurant, and so when I heard about a raw restaurant in Knoxville, TN, I had to try it. Glowing Bowl is a great little eatery inside a yoga studio right outside downtown Knoxville, and the dishes I tried were really good. The big standout was a raw butternut squash soup made with coconut and filled with cinnamon. I expected a regular, cuminy butternut soup and was shocked and delighted to taste its sweetness and feel the grit of cinnamon. I've gotten as close as I can to replicating the recipe here. This recipe can't get any easier when you have a VitaMix. All I did was put everything in the blender and mix on high for about a minute. If you have a regular blender, it should work as well, but you might want to strain the mix afterwards to take out any chunks. You want the soup to be thick, but not so thick that it coats your mouth. You can always add more or less coconut milk to get the texture correct. Learn more about A Fresh New Vegan You here, including some testimonials from readers. I wrote A Fresh New Vegan You because I kept hearing the same types of questions about veganism. People wanted to know what it could do for their health, for their weight loss goals, and for their children. I often had questions about getting proper nutrition on a vegan diet, especially on protein and calcium, and balancing meals. Some people wondered about vegan pregnancy and being an athlete on a vegan diet. There are just so many books about each one of those topics that I wanted to simplify it and put everything in one easy place. Nobody has time to spend researching everything, and we all need streamlined information where we can easily find answers in one place. 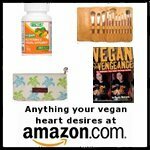 I would love to know what you think of A Fresh New Vegan You and if you have any ideas for other helpful books. You can submit comments or feedback to me directly by using my contact form. The two biggest questions I've gotten about the eBook so far are about 1). buying a hard copy edition and about 2). paying without using PayPal. 1). 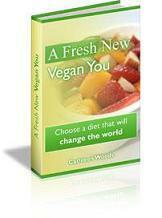 Right now there are no plans to release a hard cover copy of A Fresh New Vegan You. That doesn't mean we'll never have one, but for the time being we like having it available online. You can always download it and print it out, which would make it similar to a hard copy. If you really, really want a hard cover, make sure to let me know so I can weigh that option. 2). As for payment options, you can order directly from the source rather than using PayPal. On the payment page, click on the left side where is says "enter your credit card information now." If you have a PayPal account and have logged into it recently, your computer may not allow this option. In that case, all you have to do is to log out of internet explorer, clear your cookies, and then log back in. Now you should have no trouble ordering your copy. If you have any problems, please let me know. Within a few months, Vegan Nutritionista is going to have a makeover. You'll still get all the same great information, but it will look neater and be easier to find. I'm excited for this change and hope you'll love it too!